- Kamfers Dam supports the largest permanent population of Lesser Flamingos in southern Africa, with at times up to an estimated 60 000 individuals (comprising more than 50% of the southern African population). - Large numbers of Lesser Flamingos are attracted to the wetland to feed due to the very high concentration of the flamingos’ food, blue-green algae, in the dam’s water. 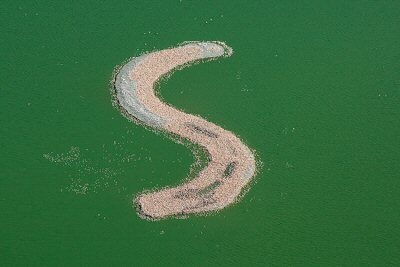 - During 2007/8 Lesser Flamingos bred on a purpose-built island on Kamfers Dam, producing an estimated 9000 chicks. The island was constructed by Ekapa Mining for which they received the prestigious Nedbank Capital Green Mining Award. Breeding continued for the next two years and during the 2008/9 breeding season 13 000 chicks were produced and in 2009/10 another 1 800 chicks were counted. Breeding on this island took place from October through to April. - Kamfers Dam is currently the only breeding locality for Lesser Flamingos in South Africa. - It is also one of only four breeding localities in Africa (the others being Sua Pan in Botswana, Etosha Pan in Namibia, and Lake Natron in Tanzania). 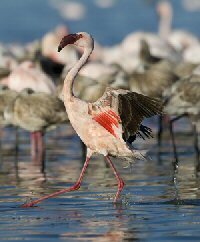 - The Lesser Flamingo is listed as “Near-threatened” in national and international red data books, mainly because of a declining population, few breeding sites, and human induced threats to the breeding sites. 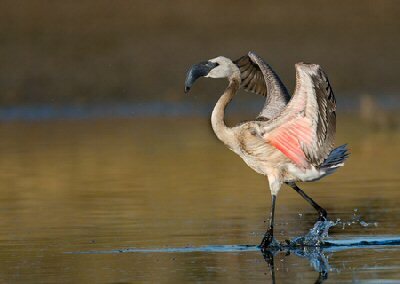 - Kamfers Dam's flamingos have huge ecotourism and economic value for the city of Kimberley. Many businesses use the flamingo in their logos, and people come from all over the country to see the birds. - Flamingos are important to the residents of Kimberley, and the city has a Flamingo School, a Flamingo Real Estate, a Flamingo Race Course and a Flamingo Casino. Flamingos are also included in the emblems of the Sol Plaatje Municipality and the Frances Baard District Municipality. There has been a continued increase in sewage effluent being released into Kamfers Dam, and recent higher than average rainfall during the summers of 2009/10 and 2010/11 has resulted in half of Kimberley’s storm water runoff ending up in Kamfers Dam. Evaporation rates have also been lower due to more humid days. As a result, the amount of water in Kamfers Dam is more than 2 m higher than the maximum level which it can hold and it is overflowing its banks, with severe consequences to the ecology, tourism and railway lines. The breeding island was almost covered in water by November 2009, but despite this the Lesser Flamingos bred on the small area still remaining above water. Many chicks drowned as the water level rose, and only 1 800 chicks were counted. By December 2010 the island was almost totally submerged and no breeding was attempted by Lesser Flamingos, but the flamingos still stood knee deep on the island to feed. Greater Flamingos bred for the first time on the very thin strip of island remaining above water in January 2011. In March 2011 the island was totally under water and by June 2011 the water had risen to over 1 m above the island. The ore railway line passing along the southern shore of Kamfers Dam flooded and this line had to be decommissioned. The ballast of the railway line along the eastern edge of Kamfers Dam next to the N12 started eroding away, and earthworks have recently been done to build supporting walls to prevent further erosion of sections of the line. This has cost millions of rands. The planned viewing platform with bird hide for tourists has been put on hold as the area where it must be constructed is also under water. The Sol Plaatje Municipality planned to start pumping excess treated sewage water into another pan close to the Vaal River in March 2011 to reduce the amount of water entering Kamfers Dam. The water pipeline was finally completed and since February 2014 excess water has been pumped away to another pan near the Vaal River. The water level of Kamfers Dam has dropped and the previously flooded flamingo breeding island has emerged and is being used by the flamingos for roosting.